I do not know how I could forget to write this into my original post, but there you are. So on Thursday the 10th, we picked up Beloved’s sister and headed south on Route 101 to get some breakfast at Golden Harvest. So we’re driving along and then… we see a man with some sort of animal that was NOT a dog…so we look closer. It’s a man walking his turkey. Really. A male turkey, in full courting colors, fluffing his feathers as he struts down the sidewalk. His owner had a thin, long stick that he used to guide the turkey and keep it on the sidewalk. Did you get that? It’s a man, WALKING HIS TURKEY! Pretty much sums up life here in Eureka. Expect the unexpected and you’ll still be surprised at what shows up. Of course, we talked about it for a while. We’re “newbies” here and really, a pet turkey is noteworthy. We got our tattoos and then decided to celebrate that by going up to Arcata for California style sushi at Tomo. We had about 7 or 8 different kinds of roll, some great sake and good times. Our waiter was awesome, took care of us very well. So we’re settling the tab, it’s quiet in the restaurant, mostly empty of other patrons. We’re talking to the waiter about SIL visiting, the stuff we’ve done to show her the town…and we mention the turkey. “I danced with that turkey.” he says. He went on to explain that he was out, the owner was walking it, the turkey was doing the feather fluffing thing, so our waiter mimicked his motions and they danced. Did you get that? A DANCING TURKEY! Well, you can’t get much more incredible than that. We all agreed that “I danced with that turkey” is going to be a catchphrase for us. Beloved: His name is Jack Lincoln. Beloved: The turkey. His name is Jack Lincoln. His brother’s name is Leatherface. He has a harem and children. A pet. A dancer. A lover and a father. A turkey named Jack Lincoln. I’ve seen it all now. But in this place? Probably not. But how do you top a turkey named Jack? I danced with that turkey. Back story: Beloved’s sister, my sister-in-love, hereafter referred to as “SIL” is a costume designer. An amazing, creative costume designer. Who is 2/3 of the way through grad school in IL to gain the paper proof of her abilities known as The Master’s Degree. She’s not only been burning the candle at both ends, but in the middle and anywhere else the wick dared to peek out. So Beloved and his parents managed to convince her to come visit us as a well-earned and much-needed break from the grueling millstone of school and shows and summer jobs. 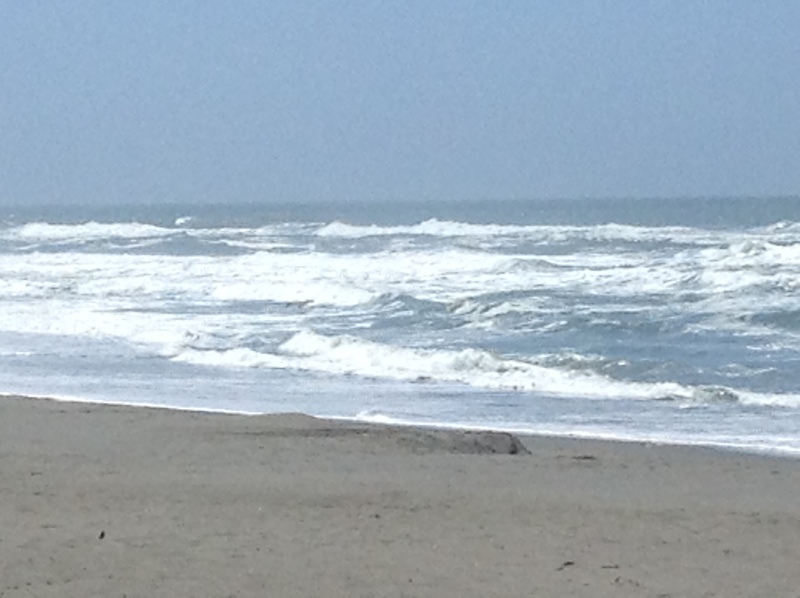 And after talking to her, Beloved got the vacation extended from 4-5 days to 9 full days in beautiful, calm Eureka. Next morning (or later that same day, depending on how you look at it), we gather her up and the meals begin…during these 9 days that we had with her, we took her to all of our favorite places to eat, carefully planned so as to maximize the number of restaurants we could fit in with us only eating 2 meals a day. We hit Walgreen’s and Target for some of the little things she forgot, to replace an extension cord that the TSA absconded with on her flight out here, and beach paraphernalia such as a chair, bucket (for seashells) and a hat. We hit Old Town one day, having lunch at the Cafe Nooner and then she and I walked around the shops. Well, she walked, I rode my new(ish) scooter; Beloved went back to her motel and hung out until called to fetch us for dinner at the next restaurant on our list. We repeat that process a day or two later to hit the local thrift stores–which she may have actually enjoyed more. SIL has been thrifting most of her clothes for a long time. She found some great stuff–and I didn’t do too badly myself! We had Chinese food, Vietnamese, Thai and German. We had Mexican food and California sushi, as well as Japanese (traditional) sushi. All of it fresh, most of it local, some of it organic. A better quality of food than most people eat and a sure fire way to help her restock her body’s energy. Lots of sleep and days of doing nothing in particular, just what the Doctors Brother and His Wife had ordered. I have to admit, living right by the ocean, the only kind of food we didn’t feed her was seafood (other than in the sushi and that’s not everyone’s idea of seafood, even if it is fish! )–Dungeness crab season ended as she arrived, so we’ve put that on the “To Eat” list for the next time she’s here. We showed her Eureka, our Costco which has a lot of organics (probably due to local demand for it), our house and the little town we live in (south of Eureka). We went to the fireworks show on the 4th–first one I’ve been to in years. For a small town, it was downright impressive–about 20 minutes long, with fireworks I’d never seen before. We sat at one of the Boardwalk down on the channel where the boats go through to the ocean–and the marina resides. Lots of people, but all of them happy and pleasant. We even had a puppy cuteness overload with the people next to us having 3 puppies, maybe 2 months old…awwww. We took her to the beach. Four or five times in the time she was here. The first time, we hit the jackpot with the wild life. She was happy to see all of the dogs, which we also enjoy. (Or as Beloved points out, there are only 3 rules for this beach: don’t turn your back on the ocean, beware of the rip tides, and if you have an earthquake, assume tsunami and move to higher ground.) But some of the other things we had talked up to her also showed up–a flight of pelicans, almost in slow motion, passed over our heads, a serious photo op if ever there was one. She got to see not just one, but FOUR horses, being ridden on the sands. We also saw those little bobbing brown heads that are seals. And of course, the surf fishermen, the kites, the terns and other shore birds and, last but certainly not least, the ever-changing, ever-eternal ocean. I was very glad to have this time with her. It’s the first chance that SIL and I have had time together without a major holiday and everyone else around. And lest you think that I monopolized her time, I made sure that she and her brother had time together without me as well. Maybe not as much as she and I did, but hey, they already knew each other. Even with the limitations of our disabilities, we had a great time having her here and found that we could push ourselves to the point of being able to spend as much time with her as possible. We only had to beg off from a couple of late night talk sessions–and she allowed as she was tired, too–so that wasn’t too bad. 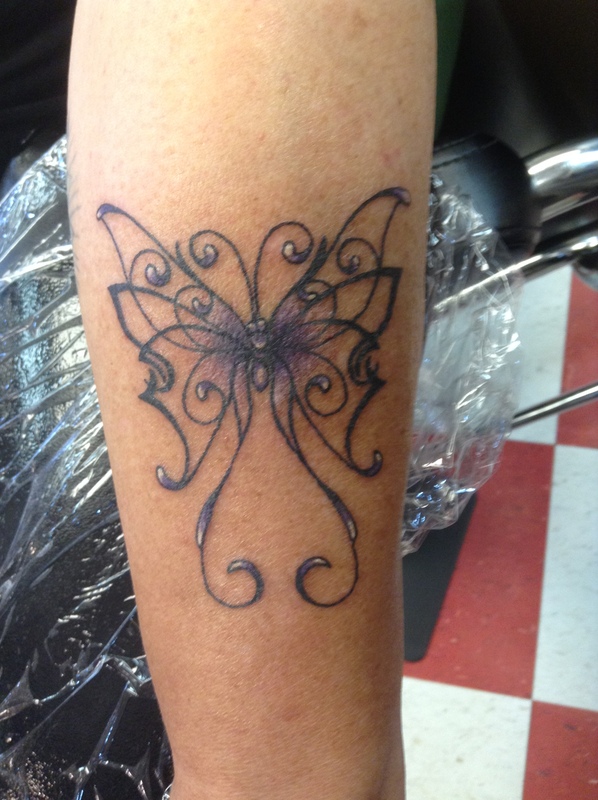 This is my purple butterfly for Fibromyalgia Awareness, a permanent sign of both my disease and a hope for a cure or at least better treatments for the conditions it brings with it. Amazing scrollwork, very fine lines for the outline, just great work all around–to the point where I may have to start saving up for (and doing in stages) the half-sleeve tattoo I’d like to have on my right arm. The left is saved for a military-style “flash”, where badges are located on the uniform, for a personal tattoo that represents me and the Beloved. The half-sleeve will be a compendium of my life, my children and grandchildren, things that are important to me. I feel that I have finally found an artist I can work with, whose style is very complementary to what I want my tattoo to look like. So SIL and I bonded through ink and needles, as well as some amazing meals. She is seriously considering basing out of here once she’s out of school, as she will essentially freelance costume design–this keeps her from being limited to one company, one place. I also suspect that her (and Beloved’s) parents may also end up here, having both retired just this past May. They are already making tentative plans to come see us at the end of summer, beginning of fall–and I think SIL’s report will only encourage them to visit us. They want to live near their children, and since Beloved and I are already out here…and SIL may also be, just stands to reason that we will soon all have CA addresses. This was the closest thing to a vacation we’ve had, almost ever, in our 4 years together. It was fun and tiring, happy and way too short–and I’m so glad we got to share it with her. We are looking forward to repeating the formula of good eats when the parents come out–and Beloved’s best friend, who is to visit us next month. How lucky are we, to have all this good food around us–and to be able to share it with the people who mean the most to us? Now we rest up and recuperate, back to the usual schedule of doctor’s appointments and preparing for my SSDI adjudication the middle of August. Lots of memories were made this week and a half–and the last place we took SIL to, before putting her back on the airplane back to IL? The beach, of course.